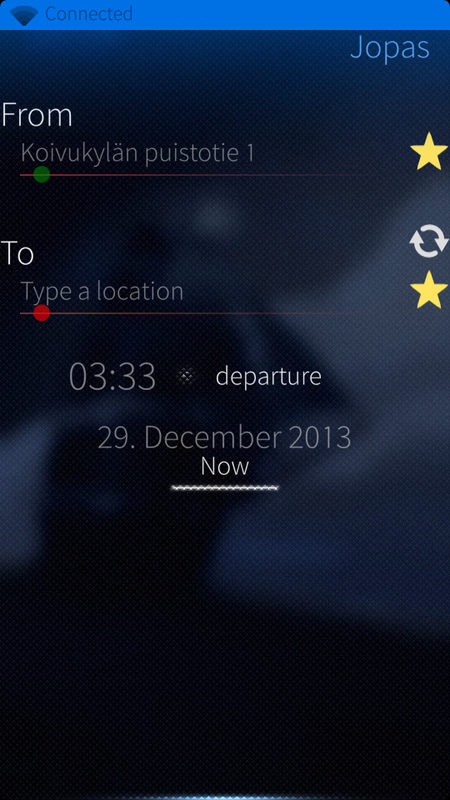 Journey planner for Helsinki & Tampere area - based on Meegopas. I love this app! However, it seems that there is no way to come back from the split view with the stops for a line in the upper part and the map on the lower part. No problem when the map is in full screen though (from the pull-down menu). When I do this the only way I found to go around is to start the app again. just in case if you haven't noticed I have continued development of this in my fork. This issue (and a couple of others) are now fixed. Hey, thanks for the answer. I'm already using JollaOpas :) Thanks and congrats for your hard work! Works well with both Jolla and N9 versions. I think the simple is the best. App should not contain too much information. I like very much both Meegopas and Jopas. Show info for a selecteed route and swipe left to see the previous route suggestion and right for the next suggestion. There should be a way yo restore th selected route maybe. Another option would be to search a favourite route when you swipe one way and the reverse when swiping the other way. 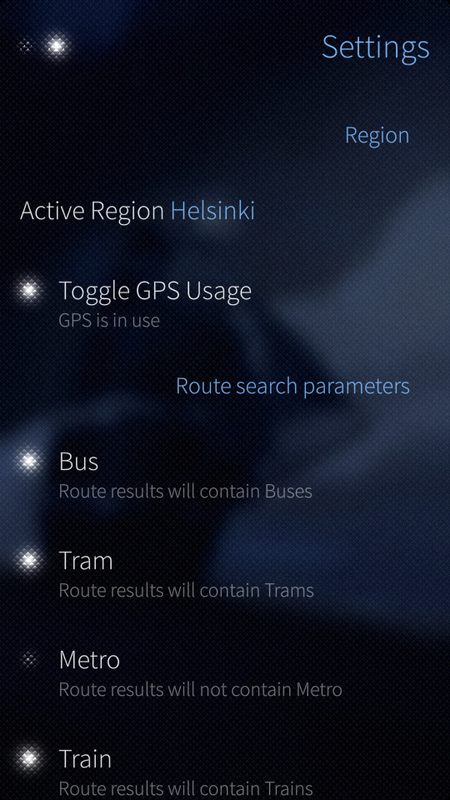 I noticed that Jopas didn't offer me any option with line changes (reittejä bussin vaihdolla) when I searched for routes. Old Meegopas offered me routhe with changes when I tried in the same exact spot and time. https://github.com/rasjani/Jopas/issues/19 updated with more relevant info, root cause most likely found .. fix within couple of days along with couple of other enchancements.. Fantastic! Thank you. I'll get you the log file if the fix doesn't help (I haven't tweaked my way to root access yet). I installed the app through Warehouse, btw. New version where this this *should* be fixed is now in Openrepos, just update and see if things work now for you. Halleluja! It works now!! Thank you! Would it be possible for the app to remember the selected city setting? I live near Tampere and it frustrates me having to go to the settings and choose Tampere instead of Helsinki every time I launch the app. Or have I missed something critical? Default are should be remembered, i've seen this bug but as im not living in tampere, i didnt fix it yet. should be fixed in next release within couple of days ..
when jopas with white screen starts up, close it down after few seconds. Also, could you guys tell me what sort of method you used to install the application ? Download and rpm, pkcon, warehouse client ? What can I do? The initial setup (choosing to use GPS) of the app froze and I closed the app. Since that all the app does is that it shows me a blank screen. I've reinstalled it couple of times and deleted the folder under /home, but the behaviour just stays the same. Same problem here... froze at the initial setup and haven't worked since. Only showing the blank screen, no matter what I try. It's relief to know I'm not the only one. I suppose we need to find a way to completely remove the app (+settings) and revert all the changes it has possibly done to the system. After that reinstalling should work out. So, any ideas how to continue? Thanks! That was pretty logical but I just didn't think about it. The map seems to work great too. Occasionally the map "froze" in the beginning so I couldn't pan the map but didn't find out why. Works really well already :P Now hoping to see some more features in the future like route maps etc. Route maps ? When you pick a route, pull down in the stop list and you will get a route map from pulldown menu..